The wacky adventures of scientists traveling to the Earth's core have been a favorite plot line in Hollywood over the decades, but actually getting there is mostly science fiction. Now, a group of scientists is using some of the world's most powerful supercomputers to do what could be the next best thing. 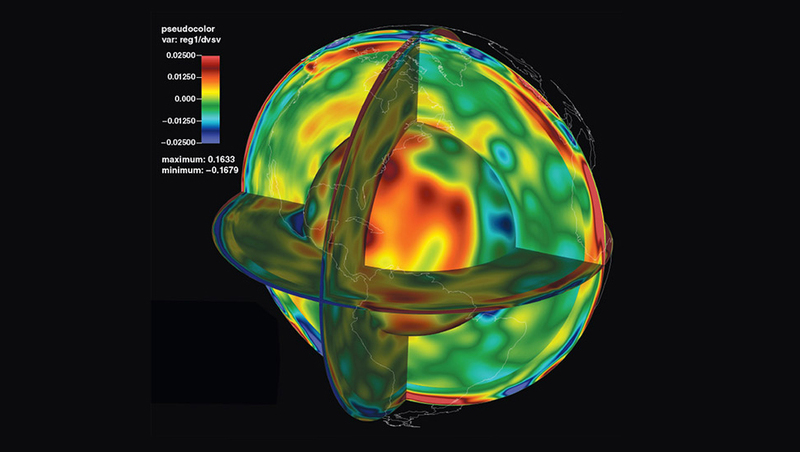 Princeton's Jeroen Tromp and colleagues are eavesdropping on the seismic vibrations produced by earthquakes, and using the data to create a map of the Earth's mantle, the semisolid rock that stretches to a depth of 1,800 miles, about halfway down to the planet's center and about 300 times deeper than humans have drilled. The research could help understand and predict future earthquakes and volcanic eruptions. "We need to scour the maps for interesting and unexpected features," Tromp told CBS News. "But it's really a 3D mapping expedition." To do this, Tromp and his colleagues will exploit an interesting phenomenon related to seismic activity below the surface of the Earth. As seismic waves travel, they change speed depending on the density, temperature and type of rock they're moving through, for instance slowing down when traveling through an underground aquifer or magma. Thousands of seismographic stations worldwide make recordings, or seismograms, that detail the movement produced by seismic waves, which typically travel at speeds of several miles per second and last several minutes. By combining seismographic readings of roughly 3,000 quakes of magnitude 5.5 and greater the geologists can produce a three-dimensional model of the structures under the Earth's surface. For the task, Tromp's team will use the supercomputer called Titan, which can perform more than 20 quadrillion calculations per second and is located at the Department of Energy's Oak Ridge National Laboratory in Tennessee. The technique, called seismic tomography, has been compared to the computerized tomography used in medical CAT scans, in which a scanner captures a series of X-ray images from different viewpoints, creating cross-sectional images that can be combined into 3D images. Tromp acknowledged he doesn't think his research could one day lead to a scientist actually reaching the mantle. But he said it could help seismologists do a better job of predicting the damage from future earthquakes and the possibility of volcanic activity. For example, they might find a fragment of a tectonic plate that broke off and sank into the mantle. The resulting map could tell seismologists more about the precise locations of underlying tectonic plates, which can trigger earthquakes when they shift or slide against each other. The maps could also reveal the locations of magma that, if it comes to the surface, causes volcanic activity.